If you’re a braces wearer, we’ve got you covered! In this article we’ll be taking a look at the best toothpaste, mouthwash, floss and orthodontic kits for braces. The recommendation from the NHS and leading dental professionals is to clean your teeth at least 2 times a day, or if possible after every meal. This can be problematic for many people as they go about their day, but food particles that are allowed to remain in brackets until the night time clean will start developing into plaque. Plaque begins to form within a couple of hours after brushing. Furthermore, lodged food particles can be unsightly and even lead to bad breath. Finding that extra few minutes in your day to give your teeth the extra clean is important. Even if you can’t find as much time as you would ideally like, a minute or so giving some attention to your teeth and brace post food will go a lot further than paying no attention at all. 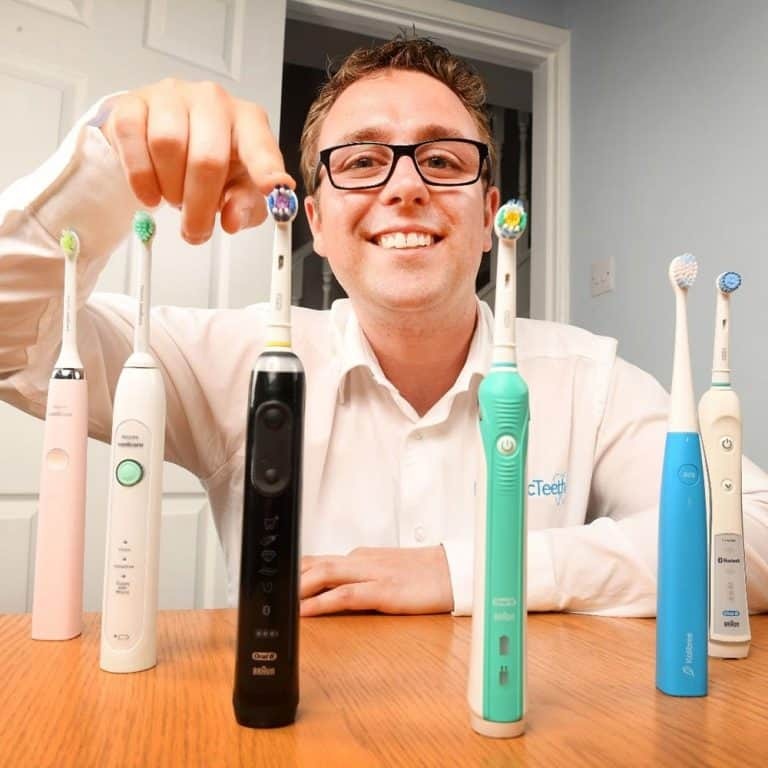 We have spoken about how easy some electric toothbrushes are to take with you in our article on the best electric toothbrushes for braces, but that is not always the best or most convenient solution, so in this article we’ll have a look at some other options: toothpaste, mouthwash, and floss. You will have seen the immense number of choices you have when shopping for toothpaste, which one do you go for? There is no one toothpaste that you must use when brushing your teeth, if you are wearing braces. However, you really should be using a toothpaste that contains fluoride. Most of the typical over the counter/off the shop shelf toothpastes contains this ingredient. A fluoride based toothpaste, irrespective of whether you are wearing braces or not, is always advised. It is important for helping keep the enamel on your teeth strong whilst helping teeth to re-harden after exposure to acids in your diet. Fluoride can help make teeth less susceptible to damage from bacteria, acids and food. Even if the local water supply in your area contains fluoride, still purchase a toothpaste with this in it. Whitening toothpastes might appear desirable, but when wearing a brace avoid these. The paste will only be coming in contact with part of the tooth surface, some will be hidden under the bracket and bonding agent. Should the whitening paste work, the part of the tooth under the bracket will not show such colour improvement. It is best to wait to complete any whitening process until the orthodontic treatment has finished. For more information, read our article, teeth whitening with braces. So let’s first bust this habit that so many people have. You should not rinse your mouth with mouthwash straight after brushing your teeth. Doing so simply washes away all the goodness that was left behind by the toothpaste. The effective ingredient, fluoride, is a higher dose in toothpaste compared to mouthwash. Mouthwash is best used in between brushing sessions. And in fact, current NHS guidelines recommend that anyone who wears braces uses mouthwash at least once a day in addition to brushing. Maybe you feel your mouth needs a re-fresh mid morning or late afternoon. Perhaps you have recently had a coffee or a milkshake and want to rid the mouth as best as possible of any damaging bacteria, then is the time to use it, to get best effect. Just like the toothpaste there is not necessarily one best mouthwash to use with a brace. You may have a preference for a particular brand or perhaps prefer one without alcohol, a common ingredient in mouthwash that gives many of them the cleaning power that they offer. The liquid can be rinsed around the mouth, get into gaps and places regular brushing cannot whilst leaving behind an effective coating that gives the mouth freshness and the ability to fight residual plaque. Flossing is something many people hate, but sadly it is a necessary evil when wearing braces. The small and intricate gaps within the brackets and wires of braces are a perfect home for bacteria to reside, grow and develop into a potential problem for you oral health. It is strongly advised to use traditional string flossing methods as this is one of the best options for getting in between all the tight gaps between teeth. Using a waxed tape floss can be beneficial as this glides easier over the teeth and brace and has a larger surface area to come into contact with the teeth. It does sadly take a bit of time and dedication, but you should do this everyday. Due to the small gaps that are often involved, feeding a flimsy floss strip through the gaps can be difficult. 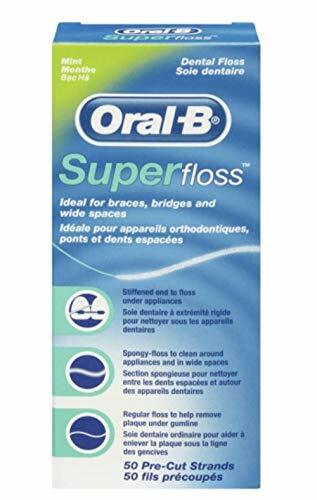 50 strands of floss are provided in the pack. It is all pre-cut and at one end there is a stiffer end that allows for feeding the floss through the dental appliance to be much easier. 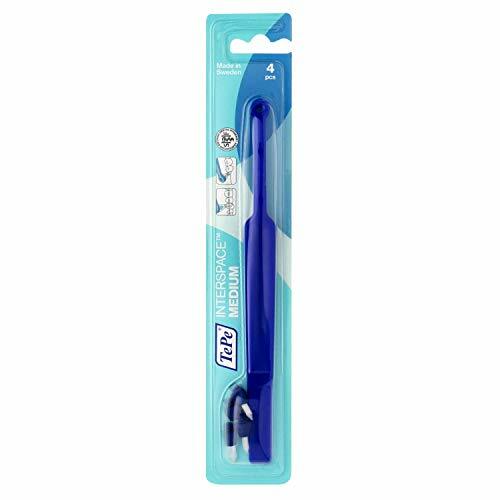 You could also consider using a floss threader such as those from FlossFish (view here on Amazon) and Gum (view here on Amazon) that allow you to more easily feed your preferred floss in between dental appliances. If you want to get a good overall clean but do not enjoy the thought of string flossing the then you could take advantage of tools like a water flosser which gives an alternative, faster and more convenient option for flossing if time is short. We have put together some of our recommendations of the best water flossers for braces. Aside from regular string/tape floss the shape and intricacy of the dental appliance can mean that more specialised tools are required. TePe make a fantastic range of products to suit the needs of any brace wearer. Generally, TePe interdental brushes are less fiddly than dental floss, and in many cases remove more plaque around the brackets. They are also more compact than a regular toothbrush and so may be a good alternative to a full brushing session after lunch. TePe are a specialist in interdental cleaning products you can learn about the brand and what an interdental brush in our complete guide to interdental brushes. The following video shows the best technique and shares tips on how to floss correctly. The best orthodontic kit is in our opinion the one you put together yourself, with the tools and items you enjoy using and find most effective. We would recommend perhaps keeping a few essentials in the car, at work or places you may frequent regularly, maybe like a partner’s house or something, if you can afford to do so. This way you are safe in the knowledge that you can get cleaning as and when you need to. Convenience can be king and having a pre-made kit can be incredibly helpful at certain times. There are a number of different options, but ones we like in particular are. This information is provided as a guide and we really hope that it has helped you navigate the confusing world of cleaning and taking care of your brace and mouth. If you have any questions, leave them in the comments below and we will be sure to get back to you, or do consult your dentist or orthodontist.